Download Central Intelligence in Digital HD from the iTunes store. 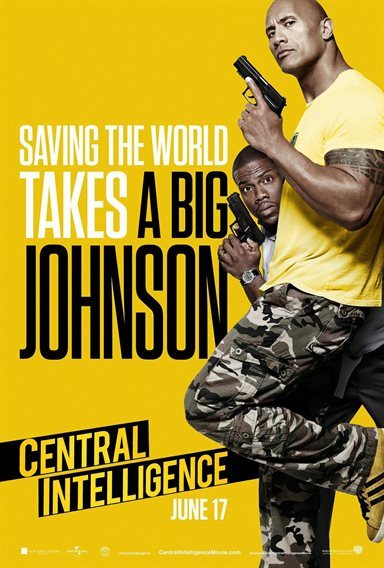 Central Intelligence images are © Warner Bros.. All Rights Reserved. What happens when you peak in High School and it all goes downhill 20 years later? What happens when you were the geek in High School and now you‘ve peaked 20 years later? 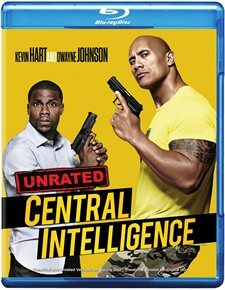 For Calvin (Kevin Hart; Ride Along) and Bob (Dwayne Johnson; Furious 7) that is exactly what happened in this year's Central Intelligence. Bob was the fat kid at Central High School that got picked on as was thrown naked into the middle of the crowded gym during a pep rally for everyone to laugh at. Calvin was the cool jock everyone loved who was awarded most likely to succeed. Calvin was the only person who was nice to Bob and didn't laugh that fateful day in the gymnasium. Now it's their 20-year high school reunion and, out of the blue, Bob (formerly Robert Weirdicht now Bob Stone) contacts Calvin to meet up for a drink but things aren't really all they seem to be. Bob unknowingly gets Calvin, a forensic Accountant, to hack into a worldwide database and gets him in trouble with the CIA. Suddenly Calvin finds himself in an International espionage adventure with Bob not knowing if he should trust him or not. Billed as a comedy, the film delivers a few chuckles but misses on the big laughs. With Hart and Johnson, one would think the movie is primed for some really funny moments but they mostly seem to fall flat. Hart is very good but tends to lean towards almost all of his other previous roles. The story line is actually interesting because, on more than one occasion, I began to wonder who were the good guys and who were the bad guys. While the premise of the HS Geek coming out of his shell and the popular guy not meeting expectations is nothing new, the twist of National security adds a nice component to the plot. The 1080p High Definition video quality is great which accentuates every bulging muscle on the Rock's body (seriously... enough is enough already). The DTS-HD Master 5.1 audio is sharp but I would expect no less from today's Blu-rays. The surround sound stereo audio is terrific and bullets can be heard flying at the viewer form every angle. The extras are sort of cute, including a commentary, mildly funny gag reel, alternate scenes, couch time lapse showing how the crew changed the living room setting all in one scene, Line-o-rama highlighting how the actors improvised some of the funny and insulting lines throughout the film, and a dance off between Dwayne Johnson and Sione Kelepi, the young man who played naked Robert dancing in the locker room shower. The Blu-ray also includes an unrated cut with 9 more minutes of footage not seen in theaters. With Hart and Johnson attached to this project, I was expecting some really funny moments and the theatrical trailer made is seem as if they would deliver, but I was disappointed. While there were one or two cute moments, nothing made me really laugh out loud, which was a shame. The film definitely had potential but missed its mark. While I would consider watching it once, I wouldn't necessarily feel the need to own this title in my permanent collection…unless of course you are a fan of the Rock. This is gonna be so funny!! !